The content of this article provides interesting history, facts and information about Roman Soldiers. 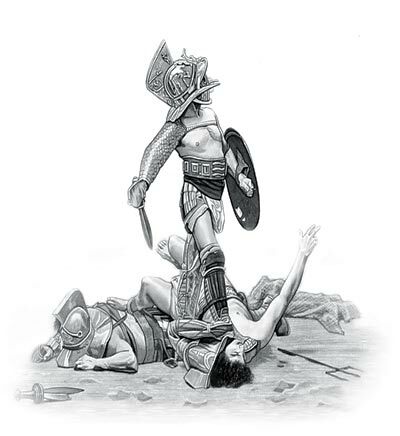 Read about the life of a Roman Soldier, the Legions and punishments such as Decimation. What was the life of a Roman Soldier like? The life of a Roman soldier was hard and disciplined. Roman soldiers were trained to march twenty miles a day, under a burden of eighty pounds. Roman Soldiers had the skills and abilities to swim rivers, to climb mountains, to penetrate forests, and to encounter every kind of danger. The soldiers of the Roman army provided the labour to build walls, forts and roads. In fact Roman Soldiers built over 250000 miles of roads, the majority of which were in Western Europe. Roman soldiers built numerous forts - the purpose of these constructions were to act as fortified bases. These forts were built as defences and as power bases. Wooden stockades were erected and surrounded by ditches wherever Roman soldiers camped and whenever Roman Forts were built. Manpower, organisation and pre-fabricated forts enabled the Romans to build Roman Forts quickly and efficiently. His pay was only one denarius daily. Marriage for Roman Soldiers was discouraged or forbidden. According to the Roman constitution, every free-born citizen was a soldier and bound to serve, if necessary, in the armies of the state from the age of seventeen to forty-six. The army of Roman citizens was eventually replaced by a standing army made up of landless city dwellers and newly created citizens from outlying provinces. Roman Soldiers were courageous and they were trained under the severest discipline and directed by means of an organization which was divided, subdivided and officered almost as perfectly as our modern corps with divisions, brigades, regiments, companies and squads. However, the Roman Legions were different in that they contained troops of all arms, infantry, cavalry and artillery used during siege warfare. The strict regime of the Roman Soldiers and their legions enabled them to march across over and subdue most of the known world. The Roman legion consisted of four thousand men, as in the early ages of the republic but increased to six thousand during the time of Emperor Augustus. Roman Soldiers served in legions were essentially divided into horse soldiers (calvary) and foot soldiers. A Roman Legion was divided into ten cohorts. Each cohort consisted of Roman soldiers who fell into the categories composed of Hastati who were raw troops, Principes who were trained troops, Triarii who were veterans and Velites who were light troops or skirmishers. Roman military life was a mixture of excitement, toil, danger, and hardship. The rewards of the Roman soldiers were small; he was paid in glory. No profession brought so much honor as the military. A Roman Soldier was taught that his destiny was to die in battle: death was his duty and his glory. He enlisted in the army with little hope of revisiting his home; he crossed seas and deserts and forests with the idea of spending his life in the service of his country. However insignificant the legionary was as a man, he gained importance from the great body with which he was identified - his legion. The Roman soldier was both the servant and the master of the State. He had an intense esprit de corps - he was bound up in the glory of his legion. Both religion and honor bound him to his standards. The golden eagle which glittered in his front was the object of his fondest devotion. A Decanus (Decanii) was the first rank that a legionary could be promoted to, similar to a modern sergeant. A decanus was responsible for between 8-10 who shared the same tent. He was responsible for training and discipline of the men in his tent together with issuing instructions regarding erecting stockades and fortifications. Another level of promotion for a particularly loyal Roman soldier was that of a Discentes signiferorum a trainee standard bearer who would look to become an Aquilifer who carried the legionary eagle. An important position in a century was that of the Signifier who carried the Century's standard (signum) into battle (wearing bear's hide over his helmet) and was also the treasurer for the Century. All standard bearers wore animal skins over their uniforms and helmets. When an army was freed from a blockade, the soldiers gave their deliverer a crown called obsidionalis, made of the grass which grew in the besieged place; and to him who first boarded the ship of an enemy, a naval crown. But the greatest distinction that could be conferred on a commander, was a triumph; this was granted only by the senate, on the occasion of a great victory. When decreed, the general returned to Rome, and was appointed by a special edict to the supreme command in the city; on the day of his entry, a triumphal arch was erected of sculptured masonry, under which the procession passed. The severity of military discipline was never relaxed. Military exercises were incessant, in winter as in summer. In the times of peace the Roman troops were familiarized with the practice of war. It was not possible to escape the penalty of cowardice or treachery or disobedience. Roman Soldiers could be chastised with blows from whips by his centurion and his general could sentence him to death. Marcus Licinius Crassus enforced an example of Decimation during his campaign against the Gladiator Wars led by Spartacus. One of the commanders, Mummius engaged the rebel gladiators early against the orders of Crassus and was defeated. Crassus decided to inflict 500 men of the legion involved, who he deemed to have shown cowardice, with the ancient and gruesome punishment of ‘decimation’. Decimation, derived from Latin meaning "removal of a tenth" was a form of military discipline used by officers in the Roman Army to punish mutinous or cowardly soldiers. Crassus had one tenth of a legion killed. The punishment of Decimation was inflicted before the eyes of the whole army who were commanded to assemble as spectators. Each cohort selected for punishment by decimation was divided into groups of ten. Each of the Roman Soldiers cast lots (Sortition) and the soldier on whom the lot fell was executed by his nine comrades by stoning or clubbing. The unfortunate soldier would have to 'run the gauntlet' between the two rows of his close comrades who were ordered to beat him to death. Crassus decimated the legion to restore discipline - the Roman Soldiers serving under Crassus were more frightened of their general than the fierce gladiators fighting for Spartacus. The content of this Roman Soldiers category provides free educational details, facts and information for reference and research for schools, colleges and homework. Refer to the Colosseum Sitemap for a comprehensive search on interesting different categories containing the history, facts and information about Ancient Rome. Just like the subject of Roman Soldiers there is hardly a page of Roman history that is not, on some way, connected to the Roman Colosseum which became a symbol of Rome, its society, culture and life.